These gluten free dairy free sugar cookies are sure to be a favorite of your entire family. MAKES ABOUT 36 (2 1⁄2-INCH) COOKIES Versatile, sturdy, and not overly sweet, these gluten-free, dairy-free sugar cookies by Toledo, Ohio–based designer-cookie maker Geoffrey Humphrys of Baked@3Fifty solve pretty much every quandary about what dessert everyone can enjoy. Geoffrey rolls and cuts the dough thick enough to create an extra luxurious experience, adds royal icing for a burst of sweet flavor and crunch, and promises that these cookies can be frozen for two months in an airtight container. 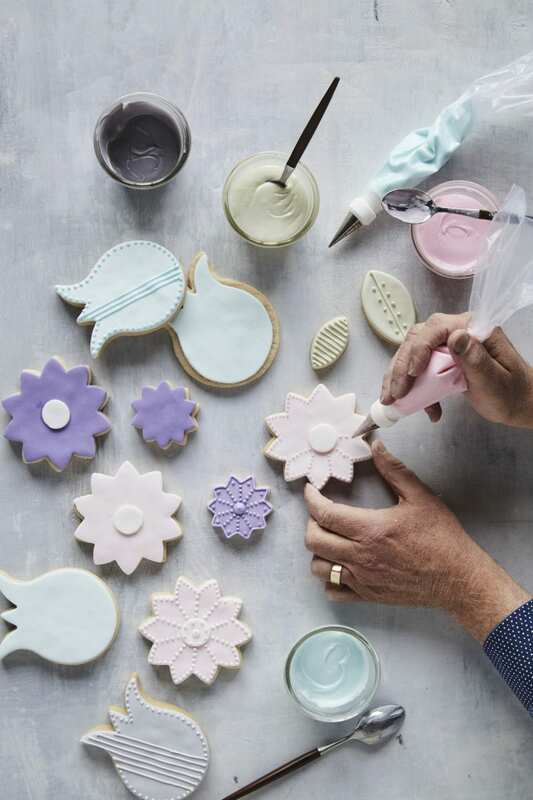 Here, he uses flower cookie cutters and colors the fondant and icing in pastel colors, but for Christmas, Hanukkah, New Year’s, or other holidays you can use any cookie shapes and colors you want. Preheat the oven to 325°F. Make the cookies: In the bowl of a stand mixer fitted with the paddle attachment, combine the sugar, quinoa flour, white rice flour, salt, xanthan gum, baking soda, and arrowroot. Mix on low speed until blended. On medium-low speed, mix in the melted coconut oil until combined. Add the egg and vanilla, mix until incorporated, then add the water and mix to combine. Scrape half the dough onto a piece of plastic wrap and flatten with the palm of your hand to a 1-inch-thick round, making sure the edge is smoothed. Wrap in the plastic wrap and repeat with the remaining dough. Refrigerate for at least 1 hour. Line 2 large baking sheets with parchment paper. Remove the dough from the fridge and let it soften for a few minutes. Lightly dust a clean work surface with rice flour. Using a rolling pin, roll out the dough to about 1⁄4 inch thick, adding more rice flour as needed to prevent sticking. Cut out cookie shapes with cookie cutters of choice, place 1 inch apart on the prepared cookie sheets, and bake until slightly golden, 12 to 14 minutes, rotating the sheets halfway through to evenly distribute the heat. Cool for at least 1 hour. If decorating with fondant: Lightly dust a clean work surface with cornstarch. Working in stages to prevent drying out, roll out the fondant 1⁄8 inch thick, then use cookie cutters to cut out shapes. Using a small rounded pastry brush, paint the top of each sugar cookie with a very light coat of cold water. Place the fondant shape on the cookie and gently press down, then round the fondant edges with your finger. Let the cookies and fondant dry on the cookie sheet for at least 1 hour before the next step of adding royal icing. Fill a pastry bag with royal icing, fit it with your preferred pastry tip, and decorate as desired. Let dry for 3 hours to assure the icing has set.